In the 1980s, Japan's economy seemed almost unstoppable and many believed that it would soon replace the US as the world's number one economic superpower. During this period, Japan was often the subject of many Hollywood films and some like Gung Ho, 1986, dealt with the issue of Japan's booming economy directly. 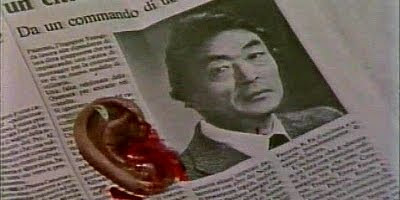 Perhaps it is no surprise then that the increasingly American influenced Italian genre films of the 80s would make a film dealing with the Japan-US economic rivalry. Tonino Valerii's Shatterer is that film. Like most late 80s/early 90s Italian crime flick, Shatterer has an all around cheesy, made-for TV vibe that makes it hard to take seriously. Despite all this, the novelty of it being the only Japanese-Italian Poliziotteschi, almost akin to what The Silent Stranger, The White, The Yellow, and the Black and Red Sun were to the Spaghetti Western genre, helps make it a fun and memorable crime flick. In addition, the film features a superb rogues gallery of Italian crime character players including Nello Pazzaffini, Tommaso Palladino, and Salvatore Billa. And what western movie involving Japan isn't complete with some sword play and a Toshirô Mifune cameo?